Wampler House Bed and Breakfast in Bloomington, Indiana - Modern Inn 3.7 Miles From Indiana University. Having been in the hospitality industry all their lives, Donna is your concierge and Zack is your Chef guaranteeing you a wonderful stay. Come enjoy Bloomington at it's best. We will be back next year, and the year after! Zack and Donna are the perfect caretakers of an amazing piece of Bloomington history. Our stay was a 10, the breakfast a 10, hospitality a 10. You need to stay here. What really sets this place apart is Zack and Donna. They are the perfect hosts and just go over the top with all the “little things” that add up to making a big difference. Honestly it doesn’t get better than Wampler House and we are truly looking forward to our next stay. We have been staying at the Wampler House Inn for 2 years while visiting our son at IU and each time it is like coming home! Zach and Donna treat you like family and go out of their way to make your stay special. The original structure (house) was built in 1857 by John and Sarah Mathers and some of the Mather's descendants have stayed here several times. The Wampler House became the home of Diana Robinson's grandparents. They bought the house, barn, garage, spring house, a couple of chicken houses and 4 acres for $2500 in 1938. *An interesting note: In 1917 a tornado took the top of the house off and set one of the chimneys in the front yard where it stands today. The owners of the house at the time of the tornado turned the chimney into a planter for flowers. Diana's grandparents followed the tradition and we do the same. 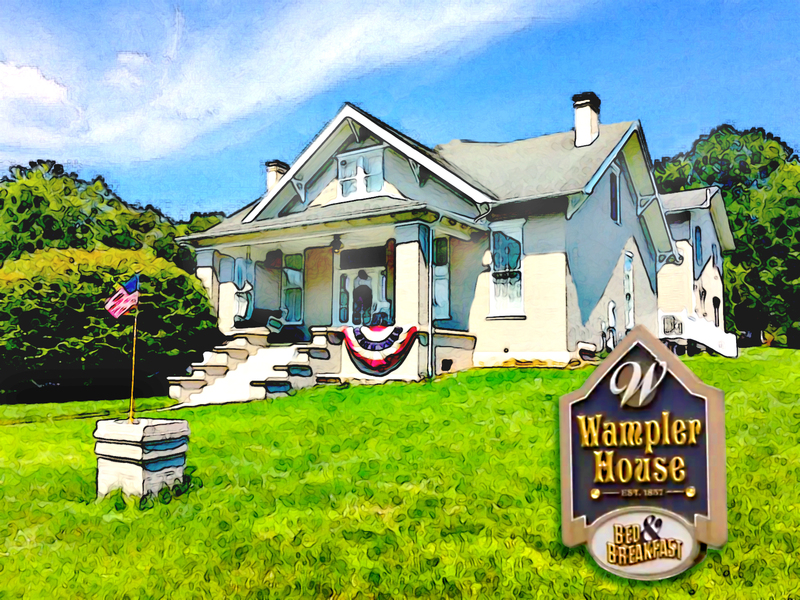 The Wampler House is an historical building. The interior and exterior walls of the original house are fifteen inches thick with 3 layers of brick and then drywall over that. The fireplaces located in the parlor and library had been plastered over whenever central heat became popular. They have been opened back up. The barn and garage still stand on the adjoining lot, although the original barn is inside another barn that was built by the Amish. Diana's brother Dave made the house into apartments for a time. After the house started falling into decline, Diana and her sister Denise decided to buy it. It needed a lot of work and they did not want to keep it as an apartment building so the Bed & Breakfast idea started to take root. Work began in February 2000 with the demolition of the interior of the house. Drop ceilings and paneled walls came out. Large soft maple trees and old cedar trees had to go and construction began on the "Caretaker Apartment", where the Innkeepers now live. With the original part of the house completely renovated and the addition done, they opened IU graduation week-end in May 2003. Zack and Donna came into the picture as 2015 was waning. They had spent their lives in the hospitality industry; Zack primarily as Chef and Donna as Manager/Host. Hospitality was their passion. It was their longtime dream to own a Bed & Breakfast in their beloved Bloomington, where Donna had attended IU, Zack and Donna had met, fell in love and gotten married. The Wampler House is their dream come true and they can't wait to share that dream with you. Aunt Pearl, as she came to be known, loved people and was always entertaining, we believe she would be very pleased to see that her home is still welcoming people, and we are very proud to carry on that tradition. Come experience Hospitality at it's finest.